GM Sergey Shipov is providing live commentary at Crestbook on the games from this year’s Sparkassen Chess-Meeting in Dortmund. In the second round Ruslan Ponomariov had the white pieces against Vladimir Kramnik. Hello, dear friends! This is Grandmaster Sergey Shipov bringing you the key second round encounter from the round robin tournament in Dortmund. Yesterday the players pleasantly surprised us. They threw themselves at each other with fists flying, making it a spectacular battle. I’m sure they won’t manage it for the whole distance. Ten all-out games at the classical time control in 11 days is an impossibly heavy burden. However, I’m getting ahead of myself. The tournament has only just started and the fighters should have more than enough energy. I’ll say a few words about Ponomariov. It seems as though Ruslan is getting back his old form and grip. I saw him at the World Cup in Khanty-Mansiysk at the end of last year. There he played as surely and steadily as in his victorious knockout World Championship in Moscow (2001-2). Ruslan is still young, though he’s already very experienced. He hasn’t lost anything and everything’s still ahead of him! Ponomariov in the beginning (i.e. the beginning of the century) played Kramnik on equal terms. But in recent years the Russian has more and more often come out the winner. Well, it’s time for the Ukrainian grandmaster to overcome that unfortunate trend. Yesterday he was given a boost (beating the fireproof Leko is really something), so now would be a good moment to build on that success. We’ll see… In fact you should realise that I’m acting as a shaman, sending mental impulses to Ponomariov to make him play uncompromising chess. No-one wants to see a dry, colourless draw after a series of exchanges in the Petroff. Better some blood is spilt! And it doesn’t matter whose… Vitaly Khimkin is doing online commentary of the game Leko – Mamedyarov. I recommend it: http://online.crestbook.com/khimkin/2010/dortmund-02.htm [Translator’s note – in Russian] It seems as though the anti-cheating delay at the tournament is much longer than the 15 minutes officially promised on the site. So we wait. 1. d4 Already a good sign – no Petroff. 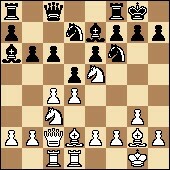 3… Bb4+ Note that the black pawn hasn’t yet appeared on d5. Which means there’s still some intrigue in terms of which opening we’ll get. 4. Bd2 Be7 No, the players have carried out the well-known to-and-fro with the bishop, which slightly worsens the white set-up. Now he can’t bring the bishop out to b2. In a number of variations the weakness of the d4 pawn can tell, as the white queen has lost sight of it. 5. Bg2 d5 What will be, will be – the Catalan. 6. Nf3 o-o 7. o-o c6 Black has not only strengthened the d5 point, but also prepared for action after taking the c4 pawn. 8. Qc2 Very cautiously played. 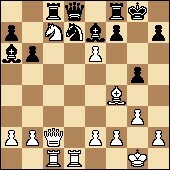 8…b6 Black will bring the bishop out to a6 or b7, depending on circumstances. 9. Rd1 White keeps the knight on b1. Of course, it wants to go to c3 where it can take part in the struggle for the centre. But that has to be done in such a way as not to lose a pawn and not to give black too much freedom. 9…Ba6 Black is dreaming of exchanging pawns on d5. That would be a gift… It’s more desirable for white to maintain the tension. 10. Ne5 But this is interesting. For professionals all of the preceding moves were banal and commonplace. But this is worth looking at more closely. The move in the game is quite rare. Moreover, in practice it hasn’t brought white good results. 10…Qc8 Judging by the speed of his response, Kramnik had also looked at the knight’s jump into the centre. He’s an internationally recognised scholar. A walking encyclopaedia. 11. Nc3 The pawn on c4 is offered up on the altar of the attack. Taking it will give white a strong initiative. Therefore… I was sure that the move 11…Nbd7 would follow very quickly, which was why I set up the sentence that way. But Vladimir has suddenly sunk into a long think. Which really amazes me. It looks as though he’s trying to work out at the board where his opponent’s trying to catch him out. And that he doesn’t like something in his calculations. Doubts have arisen… The clocks show: 1.25 – 1.18. 11…Nbd7 But after all. That’s the point of the queen manoeuvre to c8. It defends the c6 pawn, which allows black to develop the knight naturally. A novelty! A restrained and very venomous move. It seems as though black is able to successfully develop and even, perhaps, to eat up the white pawns – but that path strewn with rose petals conceals a couple of snakes. I managed to find them in analysis, during the pause. Vladimir has again sunk into calculations – the right thing to do. Sensing the moment when you have to seriously study a position is one of the most important characteristics of a top-class grandmaster. More often than not chess players during a game play relatively superficially. It’s impossible to plough through everything all game, and time doesn’t allow it. But at certain critical moments it’s worth not begrudging the time and energy to go into things deeply. And only the best of the best are able to flawlessly recognise those moments. It comes with experience. Or it’s a God-given talent. 12…Nxe5 The principled move. Kramnik has decided to test out his opponent’s idea! 13. dxe5 Nd7 Clearly the Russian didn’t spend his time in vain. He’s successfully avoided the pitfall. 14. cxd5 There were no other means of maintaining the tension. 15. Bf4 A solid move, ratcheting up the tension. White is provoking the push 15…g5, which seems to win a pawn. I think that for that Ponomariov has prepared the extremely powerful 16. Bxd5! with mind-blowing complications, in which black is balancing on the edge of the abyss. Yes! He did it. The game’s plunging into an abyss of incredibly complicated variations. 17. Nxd5 The white spring has suddenly been released. 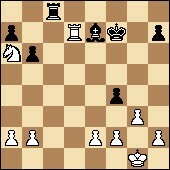 Black’s centre is destroyed, while the weakening g7-g5 might adversely affect the health of the king. Black clearly lacks piece coordination for organising resistance. However, there’s still an extra bishop in reserve… Vladimir’s thinking, time’s passing: 0.56 – 0.38. Though for now he can hold, if he doesn’t lose his cool (which would be strange for such an experienced fighter). The best moves can be found by the process of elimination. All the other continuations are clearly bad. 17…Qd8 Not, it seems, the best choice. Now the modest withdrawal of the bishop to e3, for me, sets black difficult problems. 18. Nc7 A let off in reply. In this line in my analysis I found equalising variations. 18…Rc8? Clearly the heat wave is after all affecting the players. They can’t deal with the load. However, there’s no great pleasure in playing such complicated positions. You could compare it to walking across hot coals in your bare feet. A new, powerful blow, which once more turns the situation in white’s favour. 20…Qe8 An attempt to confuse his opponent. 21. Qxe6+ Ruslan is trying to squeeze the maximum out of the position. 21…Qf7 Here neither side has a choice. 23. Nxa6 gxf4 24. Rxc8 Rxc8 25. Rxd7 White has two extra pawns – not a bad harvest! Black’s last hope lies in an active rook. 25…Rc2 26. 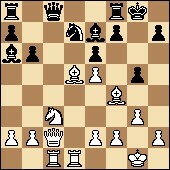 Nb4 The knight escapes with the intention of attacking the bishop on e7. The black rook is just by the by. The end is near. 26…Rxb2 Bad, as is everything else. 28…f3 The last chance for the seasoned blitzer. To threaten mate in one. 29. h4 Simple and reliable. 29…h5 Vladimir’s trying to restrain the white pawns on the kingside. But, of course, it’s a vain hope. 30. Rxe7+ Ruslan is playing quickly and inexorably. 30…Rxe7 31. Nxe7 Kxe7 Now just to find one last and not so tricky subtlety. 32. g4! That’s it. 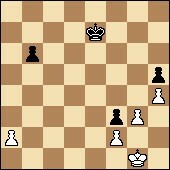 White successfully breaks through and activates his king. Ponomariov conducted the game very powerfully and deserved to win. He managed the almost impossible – to find a weakness in Kramnik’s opening preparation… The position after the 12th move will no doubt be heavily studied in the best laboratories around the world. In my notes I also made my modest suggestion (12…Bxc4), but I definitely don’t insist on it. I repeat, it needs serious, unhurried analysis. Of course black also had reasonable alternatives earlier in the game. While in the game, white already had a noticeable edge by the 14th move. Ponomariov acted very energetically, although not perfectly. He gave Kramnik one chance to save himself, but Kramnik couldn’t overcome the calculation tasks he faced. So, it wasn’t in vain that I mentioned Ponomariov’s win in the FIDE World Cup back in 2001-2. At that time Ruslan overcame almost the whole Russian team, one by one. And now it’s the turn of the current leader of the world’s strongest chess country. Ponomariov’s a Russian specialist! We’ll have to complain about him to the Great and Terrible Gary Kasparov. Let him come out of his political den and restore order… Thank you for your attention, dear spectators. With you on this enthralling evening was Grandmaster Sergey Shipov. See you tomorrow! Thanks mishanp! I love Shipov’s live commentaries, but have suffered under the Google translation. Me thinks GM Shipov simply outdid himself (is that even possible!?) this time keeping on top of the complex position at every turn with his impeccable analysis. I was on the edge of my seat with each and every mighty blow!! Thanks a lot for this wonderful site, and specially for the properly translated commentaries. You’ve increased hundred times the pleasure of following the games. The diagrams do help, don’t they! Almost all of the credit’s due to Shipov, who somehow found the time to add them to his Russian text – so I could just cut and paste rather than trying to make them myself. Of course it also helped that it was a game of dramatic moves that deserved diagrams!